KOLTHOFF – LKB GmbH offers a wide range of Roller Coverings from stock. Most of our Roller Coverings are provided with our Direct Injection self-adhesive glue layer. KOLTHOFF Laminating & Converting has been active in the laminating industry for many years and have become a trusted face in the (technical) Textile, Automotive and Building sector. quality, high supply reliability and high service, as well as our great fl exibility, are highly appreciated by our custumers for many years. The patented gluing method, in wich high-heat resistant glue is applied to the backing of the roller covering, ensured us a prominent position in the market. This self-adhesive gluing method guarantees an optimal adhesion to the roller, extends its life expectancy and saves you a lot of time and money when applying the roller covering. 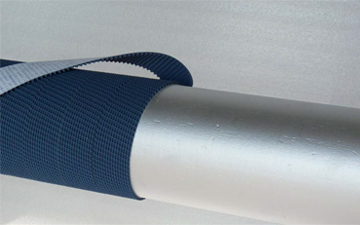 The roll length of the roller coverings vary, depending on quality, and can be either 55 or 100 m. The roller coverings can be supplied in widths of 50 mm, 70 mm and 100 mm. Other roll lengths and widths are possible on request. Our assortment consists of PVC, natural rubber, synthetic rubber, silicones, cork, nitrile rubber, plush, mohair, tape, foam, EPDM, NBR-rubber, neoprene, felt and emery cloth. 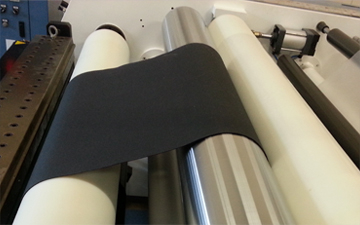 There’s a matching quality roller covering for every application. More than 60 qualities are in stock at your disposal and can be delivered within 24 hours. In short, KOLTHOFF – LKB GmbH is the ideal partner for your roller covering.